This is a weapon restrict plugin for CS:S it allows per player restrictions, ability to change the restrict sound and also comes with a warm up system! As of 3.0 it comes with a massive set of natives/forwards to be used by other plugins. psychonic for answering all of my questions and convincing me to make cstrike extension better. Snake60 for the awesome logo! // Set to 0 to allow awp pickup ONLY if it is under the max allowed. Set to 1 to use sm_allow_restricted_pickup method. // Enables admin immunity so admins can buy restricted weapons Default flag is reserved flag. Override sm_restrict_immunity_level to change. * Called when CanBuyWeapon is fired. * Return Plugin_Continue to ignore Plugin_Changed if result was changed Plugin_Handled and higher to block. * Return Plugin_Continue to ignore Plugin_Changed if sound (make sure the sound is already cached and in downloads table) was changed Plugin_Handled and higher to block. * Called when warmup round has started. * Called when warmup round has ended. * Refunds money according to the weapon. * @error	Invalid client or invalid id. * @error	Invalid client or invalid id or invalid team. * @error	Invalid id or invalid team. * @return Value of the restriction. * @return Weapon id or WEAPON_NONE if could not be found. * @error	Invalid id or invalid client. * @return Grenade count for specified gernade for the client. * Get weapon id of the clients weapon slot. * @error	Invalid slot or invalid client. * @error	Invalid id or invalid client or invalid team. * @return true if client can buy the weapon false otherwise. * @return true if client can pickup the weapon false otherwise. * Checks if it is a special round. * @return true if special round is active false otherwise. * @return true if it is warmup false otherwise. * @return true if client has the special item or false otherwise. * @note	This will return false if it is a normal weapon. * @error	Invalid group or invalid team. * @return Current round type. * @error	Invalid client or weapon index. * @note	This will return false if restrict immunity is disabled. * @error	Invalid team or invalid id. * @return	True if weapon is in override false otherwise. * @error	Invalid weapon id. * @return	True if the weapon is the warmup weapon, false otherwise. * @note	Will return false if it is not warmup. Download the zip and extract the folder. Place the files in the server according to the path in the extracted folder. mapname.cfg will be for maps and blah_.cfg for prefix it MUST have _ after the prefix (examples in the zip for test map and test prefix). Upgrading from 2.3.X to 3.0 is mostly straight forward. 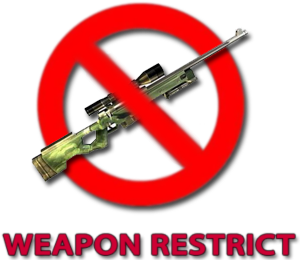 Make sure to update weapon_restrict.cfg (in the cstrike/cfg/sourcemod folder) since there are new cvars. Per player has changed dramatically to allow all weapons rather than awp only. Overwrite the file and read the next post on how to set up per player. Cleaned up a bit Seperated files warmup has its own included file along with all the remove weapon functions and command functions. Fixed rebuy/autobuy when buying vest and/or helmet or defuser and it being restricted. Now it will remove it and give the money back. 1.3.0 Still beta fixed a few bugs in buying. Fixed issue when commenting out warmup. Added per map config as well as prefix. Optimized as much as i know how. Made sm_knives and pistols be next round instead of the current round. Added cvar to warmup for infinite nades. And other tiny bug fixes that i cant remember now. 2.2.0 No longer a beta. Added restrict weapons to admin menu under its own menu option. Added cvar to allow weapon pickup and randomly remove if there was to many on round start. Added @all to unrestrict this will unrestrict all weapons. Fixed a fail load if adminmenu plugin was not loaded. Another bug fix but i cant remember what now. Added some deathmatch support again (Cant drop the bomb in deathmatch but restrictions should work). Fixed problem with pistol only or knife only rounds not allowing buying of armor defuseal kits etc.. Fixed error when force bomb drop was run from console. Added translations for weapon names. Added server command sm_perplayer_debug to help debug per player issues. No longer requires downloading of sound file. Adds support ammo cvars for grenades. Fixed bug with classnames not being all lowercase. Fixed Special rounds lasting 2 rounds rather than 1. Fixed bug with unrestrict command when passing a team. Fixed a bug when checking perplayer weapons. Fixed bug setting special rounds for after warmup. Fixed bug with weapon aliases. Added support for workshop maps. Fixed taser warmup not working. Last edited by Dr!fter; 12-27-2018 at 06:58. Inside the file should look something like this (by default). the above perplayerrestrict file would do this. Pre and post warmup configs are located in addons/sourcemod/configs/restrict simply add cvar or commands you want to be run like you would do in a server config and done. Last edited by Dr!fter; 01-20-2012 at 17:35. I have been having all kinds of weird issues with the original. Looking forward to the things on the todo list. Yea i have the orginal with so many tweeks to it. But still dosnt work perfect. So i decided to make a new one. We use Liam's version on our server and this seems like it will be a good improvement over it. I look forward to see your todo list completed. Updated, fixed a few bugs and added the admin commands sm_knives, sm_pistols, sm_restrict, sm_unrestrict. iss the bug fixed when im buy an restrictet weapon that i dont become back my money? My next doing is optimization. Want to optimize before moving on. Which will most likely mean an entire rewrite. Last edited by Dr!fter; 10-04-2009 at 18:00. I will probably switch over to this as more of the to-do list is complete! Little bit of an update. I rewrote some of the functions i will probably be releasing it sometime this week. Im just trying to add the map config to it in the next release.